Have you ever been trained in the safe use of Abrasive Wheel Machinery? this course is for you. Providing extensive information in the safe use and working practices with Abrasive Wheels. worse, death when performing certain, dangerous tasks. 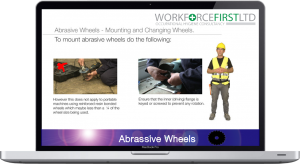 This will train your staff the basic principles of the safe use in Abrasive Wheels and know how to deal with the unlikely situation of someone being critically ill. This will allow you staff to train at any time to suit your needs. Thousands of people every year suffer from various injuries from using Abrasive Wheel at work which could have been easily minimised if a lot more people had known the basic principles in the safe use of Abrasive Wheels. This is not to replace any formal practical training, but provides an excellent guide to refreshing your knowledge from using abrasive wheel machinery. As this course will not qualify anyone in anything. So What is an Abrasive Wheel?